During the last 40 years, the management philosophy on federal forest lands in the United States has undergone profound changes as government agencies have become increasingly aware of the importance of federal lands in species conservation. Nowhere has this change been more controversial than in the Pacific Northwest (Washington, Oregon, and northern California), where attempts to maintain viable populations of Northern Spotted Owls (Strix occidentalis caurina), Marbled Murrelets (Brachyramphus marmoratus), red tree voles (Arborimus longicaudus), and other plants and animals that thrive in old forests have resulted in large reductions in harvest of old forests on federal lands (Ervin 1989, Durbin 1996). Because of the controversial nature of these changes and the need to know whether management policies were achieving desired objectives, the U.S. Forest Service and U.S. Bureau of Land Management initiated eight long-term mark-recapture studies of Northern Spotted Owls during 1985-1991 (Lint et al. 1999). The primary objective of these field studies was to provide federal agencies and the public with data on the status and trends of Spotted Owl populations and to determine if the management plans adopted by the agencies were resulting in recovery of the owl, which was listed as a threatened subspecies in 1990 (USDI Fish and Wildlife Service 1990). In addition, the recent invasion of Barred Owls (Strix varia) into the range of the Spotted Owl represents a competitive threat that many research groups are trying to assess. The information generated in these studies has been featured in many publications (Franklin 1992, Burnham et al. 1994, 1996, Forsman et al. 1996a, Franklin et al. 2000, Kelly et al. 2003, Hamer et al. 2004, Olson et al. 2004, 2005, Anthony et al. 2006, Bailey et al. 2009, Singleton 2010) and has played a key role in several court cases and in the development of the Northwest Forest Plan (NWFP). The NWFP is an interagency plan that was designed to protect all native plants and animals on federal lands within the range of the Northern Spotted Owl, while at the same time providing jobs and wood products (USDA Forest Service and USDI Bureau of Land Management 1994). The data from the long-term demography studies were also considered by the team that prepared the 2008 recovery plan for the Northern Spotted Owl (USDI Fish and Wildlife Service 2008) and by a committee of The Wildlife Society (2008) who commented on the plan. Research on the long-term demography of the Spotted Owl has focused attention on forest management and conservation of forest wildlife in the western United States. This research, and the controversy it has created, have changed forest management in the region and helped to bring about a general reassessment of the role of forest management in species conservation, forest ecosystem management, and human health (Thomas et al. 1993, USDA Forest Service and USDI Bureau of Land Management 1994, Dietrich 2003). With any large-scale, long-term monitoring program, important criteria are consistency in methods and funding, and a consistent protocol for analyzing the data and reporting the results. Standard protocols are especially important in cases like the Spotted Owl, where (1) the economic stakes are high, (2) there is occasional disagreement regarding the potential for bias in the estimates of demographic parameters (Loehle et al. 2005, Franklin et al. 2006), and (3) where many different agencies and stakeholders are responsible for collecting the data. For the Northern Spotted Owl, the methods for collecting, analyzing, and reporting demographic data have been described by Franklin et al. (1996), Lint et al. (1999), Anderson et al. (1999), and Anthony et al. (2006). Because of considerable scientific and public interest in these studies, one of the key features in the monitoring program has been regularly scheduled workshops in which all of the researchers who are conducting demographic studies of Northern Spotted Owls, meet and conduct a meta-analysis of all of the demographic data (Lint et al. 1999). Since 1993, there have been four cooperative workshops, the results of which have been described in three published articles (Burnham et al. 1994, 1996, Anthony et al. 2006) and one unpublished report (Franklin et al. 1999). The most recent of these workshops was conducted in January 2009, where we completed an updated meta-analysis in which we analyzed all of the demographic data currently available on the Northern Spotted Owl, including an additional five years of data from 2004-2008, and modeled the demographic parameters as a function of a new set of environmental covariates. Our demographic analyses, which represent the most complete and up-to-date summary of the population status of the subspecies, are the focus of this volume of Studies in Avian Biology. Estimates of vital rates and population trends are more interesting when there is some understanding of the environmental factors that may influence those estimates. Anthony et al. (2006) included covariates for the cost of reproduction and presence of Barred Owls in their analyses of survival and population trends of Spotted Owls, but they were not able to include habitat or weather covariates in their analysis. In our analysis, we included the same covariates examined by Anthony et al. (2006) but add several new range-wide weather covariates and habitat covariates in Washington and Oregon. Thus, our analysis is the most comprehensive to date in terms of the number of covariates examined. Our analysis also differed from earlier analyses of Spotted Owl populations (Burnham et al. 1994, 1996) in that we use the f-parameterization of Pradel's (1996) temporal symmetry model to estimate the annual rate of population change (λ), and examine trends in the components of population change, including survival and recruitment rates. Our analyses have led to some valuable insights regarding our ability to discern the possible influence of environmental covariates (e.g., habitat, Barred Owls, weather) on a species that has high temporal variation in survival and reproduction. Our general approach will be of interest to other research groups investigating population dynamics of other long-lived vertebrates with similar life histories. Our purpose in this report is threefold. First, we wanted to determine if the declines in apparent survival and populations that were reported previously (Anthony et al. 2006) have continued or stabilized. Second, we used multiple covariates in the analysis of demographic rates in an attempt to better understand which environmental factors best explained annual and spatial variability in these rates. We reasoned that one or more of these covariates might explain the recent declines in demographic rates of the subspecies. Last, we report on the use of the f-parameterization of the Pradel (1996) temporal symmetry model to estimate components of the annual finite rate of population change (λ), including apparent survival and recruitment rates, one of the first applications of this new technique in demographic analyses of Northern Spotted Owl populations. The Northern Spotted Owl, a threatened species that occurs in coniferous forests in the western United States, has become a well-known environmental symbol. But how is the owl actually faring? 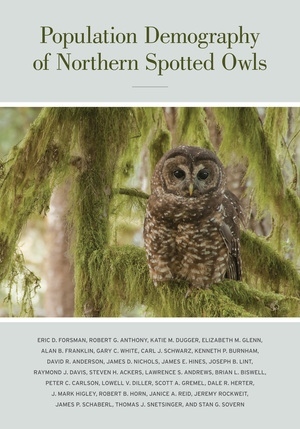 This book contains the results of a long-term effort by a large group of leading researchers to document population trends of the Northern Spotted Owl. The study was conducted on 11 areas in the Pacific Northwest from 1985 to 2008, and its objectives were both to evaluate population trends and to assess relationships between reproductive rates and recruitment of owls and covariates such as weather, habitat, and the invasion of a closely related species, the Barred Owl. Among other findings, the study shows that fecundity was declining in five populations, stable in three, and increasing in three areas. Annual apparent survival rates of adults were declining in 10 out of 11 areas. This broad, synthetic work provides the most complete and up-to-date picture of the population status of this inconspicuous forest owl, which is at the center of the complex and often volatile debate regarding the management of forest lands in the western United States. Eric D. Forsman, who collaborated with a team of twenty-seven researchers to produce this report, is a Wildlife Biologist with the USDA Forest Service’s Pacific Northwest Research Station, and also holds a courtesy faculty position as an Associate Professor in the Department of Fisheries and Wildlife at Oregon State University.